Yesterday, our team was together again for the first time since the beginning of the Christmas break. You’d think that everyone would be feeling lethargic after the time off but instead every person was surprisingly cheerful and glowing with a new sense of optimism. “Ah, of course,” I thought. New Year’s resolutions are underway. In the spirit of “new year, new me”, we each individually rhymed off the classic goals you’re likely to hear at the beginning of each year: I’d like to lose some weight, I need to be more active, I’ve got to start saving more money and so on and so forth. But the most important goal was the one we knew we’d continue working on together and, truthfully, the reason we all work at Levitt-Safety to begin with: to get workers home safe at the end of each day. At Levitt-Safety we’re always working towards the number zero: zero accidents, zero injuries and zero lost time. I’m sure many of you share this same goal. Here are our tips on how we’re working to achieve an accident-free 2019. Not sure where to start? A great way to identify what needs to be improved is by reflecting on the past year. In 2018, what worked and what didn’t? Tackle any workplace safety issues head on by reviewing past incident reports and by talking with your team. This will help set the foundation of what you’d like to see progress with the future of your workplace. If you’re looking for ways to improve your workplace health and safety, this is a great place to start. Not only does a committee like this help implement the necessary health and safety procedures that are vital to the success of your workplace, but it can help boost morale and create a positive safety culture amongst your team. While the requirements for a JHSC differ between provinces, generally these committees are made up of both managers and employees to create a holistic approach to safety, considering the concerns of workers at every level. If you haven’t already formed a committee of your own or are looking for tips on how to improve yours, be sure to take a look at our Why Your Workplace Needs a Health and Safety Committee blog. Near miss? It nearly happened. At Levitt-Safety, this is a motto that we really believe in. We get it. Reporting an incident can be time-consuming but in order to ensure it doesn’t happen again or turn into a lost-time injury, it’s vital to make any hazards in your workplace known. Whether it’s a minor trip or a full-blown slip, be sure to report any and all incidents throughout each workday for safety’s sake. In order to keep your team safe and compliant with regulation and legislation updates, it’s important to keep up to date with all the national safety news. Hint: the Levitt-Safety newsletter includes all the information you need on new products, requirements and more at the beginning of each month. You can sign up for free on our homepage. As of January 1st, drivers in Ontario can be fined up to $1,000 for being caught texting, talking or dialing on their phones while driving. Imagine if we treated being distracted at work with the same regard. Multitasking isn’t a new concept but with the integration of technology in the workplace having your handheld device on you during your shift has become the norm at many work sites. Just as it’s crucial to put your screen away while driving, it’s just as important to treat your job the same way. The consequences of talking or texting while in the middle of a job can be just as dangerous as doing it on the road. Much like with the previous point, times in the workplace are a changin’. Have your employees been trained on current workplace violence and harassment protocol? Would they know what to do if an uncomfortable situation were to arise? These health and safety concepts are just as important to acknowledge and train on as educating on first aid or wearing the proper PPE. In the case that an incident does occur, the most important thing you can have to be prepared is a trained and knowledgeable team. Don’t worry if you don’t have someone in-house to perform the training; we offer both instructor-led and online training to help you and your fellow employees become educated on topics including respiratory protection, fire extinguishers, confined space, working at heights and more. You can view our full catalog of available courses here. Ready to give up your bad safety habits? 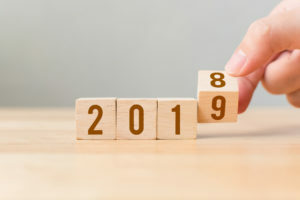 Join us in setting your goal at zero for an accident-free 2019. 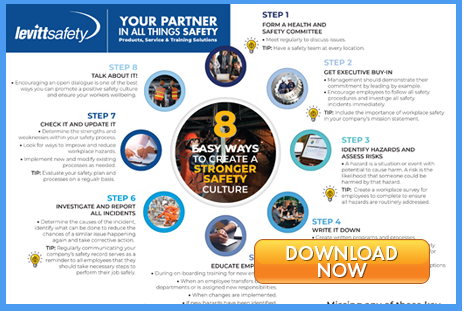 Be sure to check out or 8 Easy Ways to Create a Stronger Safety Culture download for even more tips. Have questions or concerns about your workplace? Contact us today to book a workplace safety consultation. Good luck and cheers to the New Year!